Lately, I have been doing a fair amount of debugging, and helped other people set up their debuggers. It can be very painful to make this work. To assist up and coming debuggers, I put my notes together in this blog. Here is how to get things going. Download and install Windows SDK for .NET 4.0 from here: http://msdn.microsoft.com/en-us/windows/hardware/gg463009/. Do the full install of all packages. They will take several GB. Please make sure you have a large drive (more than 100GB of space), you will need it. This is the tricky part. In order to debug properly, you need symbols. Getting those set up requires a few tricks. 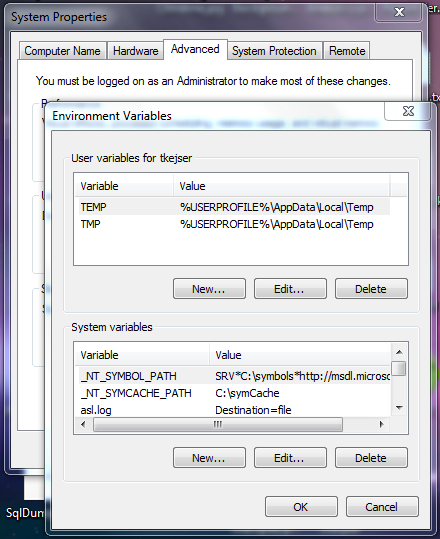 You need to set up two environment variables. I prefer to set them as system variables, since I am the only one using my machine. Note that the paths are separated with stars, not semi-colon. WinDbg.exe – A lightweight debugger for analysing dumps. Leaves a lot to be desired in usability, but it is really fast once you memorise the arcane commands required. SymChk – Used to check if symbols can be resolved. Gives verbose information with the /v command line, which is useful to validate symbol paths. See: SymChk Command-Line Options. SymStore.exe – Allows you to create your own symbol stores (under C:symbols for example). This is useful if you are debugging your own code or code which has symbols that dont originate from Microsoft. See: SymStore Command-Line Options. xperf.exe – The mother of all code profilers. This tool comes with an enormous amount of command line parameters. It would require an entire blog entry just to list my favourites (Hint: I may do one). Documentation is hard to come by, but here is a good intro: All Your Base are Belong to Us – Xperf. There are some commands that I use frequently in WinDbg. I would recommend you minidump a process you know while it is working in a test system (sqlservr.exe for example) and try them out. It is really quite amazing what you can see. d<x> There are different version of this command. But all are used to dig into data types that reside in a memory address or address range. This next link is lifted from the above article. Thanks a lot for adding this Andrew. I should probably keep this blog entry alive (and sticky) for people to expand these. Xperf has so many good command line utilities and lising common templates is really useful.